NUKED (19,000 words) focuses primarily on these explosions, codenamed Operation Redwing, and tells the story of What Went Wrong. What was dangerous. What it felt like being a human guinea pig. 1,612 army men (including me, a draftee) were exposed to radiation. So was the rest of the all male contingent (civilians and members of other armed forces), a total of 14,643. We were left to fend for ourselves and had to face radioactivity and military incompetence without recourse, relief or protective gear. NUKED, by Michael Harris, is a companion to his memoir, THE ATOMIC TIMES: My H-Bomb Year at the Pacific Proving Ground, nominated by Random House for a Pulitzer Prize. THE ATOMIC TIMES is available in an e-book edition at Kindle. This is only an excerpt, not the full version of the book. 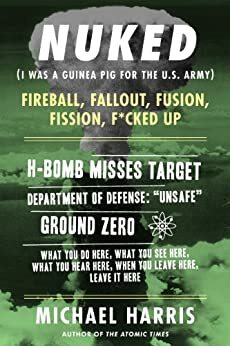 If you want to know why a human being stands willingly in front of 15 exploding nukes because they were ordered to do it by a superior officer, you'll have to buy the entire book, I suppose. The answers aren't in this one. Maybe they aren't in the rest of the story either. I would have refused the military's order, but I guess that's just me. Arrest me and get me outta here! I can't believe Michael Harris and other soldiers obeyed those demonic orders 15 times without even a whimper of protest. That's insane! That's almost as frightening as what our government willingly exposed them to. Who exactly is America's real enemy here, foreigners or our own US government? We've declared war on foreign dictates who do this stuff to their own people. I struggle with the concept of buying the rest of this book when I consider the author to be out of his mind for permitting this atrocity. Surely the results of such testing on him produced ungodly suffering and agonizing radiation sickness... and probably death. I can't work up any sympathy for someone who shoots himself in the foot and then cries about the pain. Michael Harris and the other soldiers should have refused and gone straight to jail instead. I will not be buying the rest of this book. I picked this up as a free ebook with the understanding that it is an EXCERPT from Harris's memoir and not the full version. Now that there is a price attached to this edition, I think it is fair to differentiate the difference. This is NOT the full book. The excerpt, however, is quite lengthy and gives some high-level information about Harris and his squad as they were positioned at the Pacific Proving Ground where atomic bombs were first tested by the US military. The idea of human beings being so close and absolutely unprotected (the squad was not provided with any protection or even goggles as they stood at Attention to witness the detonation of several bombs at close range) is astounding. The fact that Harris is here to tell the tale is amazing -- many of his comrades have since died at an early age from radiation exposure-related illnesses. It is a powerful story that absolutely needs to be told. The world's militaries routinely use their troops as 'guinea pigs' without their consent; whether it's for better footwear or for nuclear exposure data. My only 'problem' with the edition of the book that I downloaded was that it seemed to have the same excerpt twice, but the writing was different. Perhaps an early draft with a more polished one? In any case, it doubled the length of the preview but was essentially the same information. Based on this excerpt I am very interested in purchasing the full book. 5.0 out of 5 starsMore recklessness by the military trying to "save" us. What our government did to our servicemen, their lack of care and exposing them to dangers just to see what the effects were is......just what they do now. The first hand accounts make it all the better to understand what the men were going thru and how worried they were about what was happening to them. How they were not to question the "authorities" (who were clueless), or to say anything when "accidents" happened time after time ( I read that as the accidents were planned to see what the men could "take" before they were debilitized)....sad...and frightening! One of my biggest fears is that people forget just how apocalyptic thermonuclear weapons are. The author in relating his experience brings that home in stunning fashion. the story of these soldiers was kept from the public for too long. I remember those days, living in Southeast Missouri and being told not to drink milk or eat snow because it could make you sick. We were many thousands of miles from ground zero. So when modern demagogues tell you that man cannot destroy his environment, books like this one make it clear that he very well can, and almost did once.